Killer Characters: Too Many Gifts? At Christmas, I can count on exchanging gifts. eating a major feast, and having fun with friends and family. My Threadville friends and I have realized that, although we love giving and receiving gifts, some of us are running out of space to keep things. Just for fun, we instituted a new rule this year--we have to make the gifts, and no one gift can be bigger than a Christmas stocking. Do you have other suggestions of things I might be able to make? 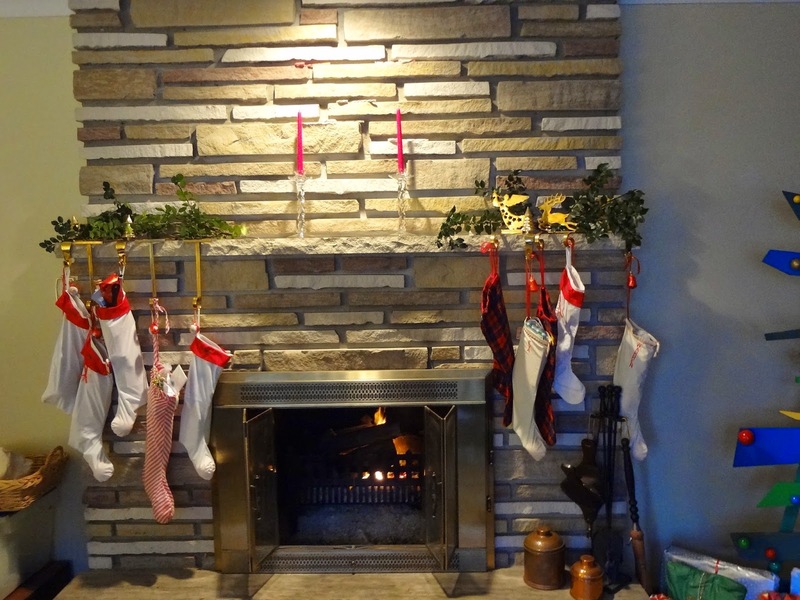 Do you have ideas for cutting down on the proliferation of gifts at Christmas and/or other times of year? One person who enters a comment below will win a signed copy of the Threadville Mystery of your choice. The are in order: DIRE THREADS, THREADED FOR TROUBLE, THREAD AND BURIED, and NIGHT OF THE LIVING THREAD. You can read them in any order. Check the sidebar to the left tomorrow to see if you won. And come back every day in December for another Killer Character's Season's Readings giveaway! Good idea, to limit size of gifts. A scarf to match the hat and mittens would be a great gift, though a little bigger than a stocking. It could be a large stocking. My idea would be homemade spicy nuts. I see recipes for them online. Or honey cinnamon nuts. Granola mixed with M&Ms and raisins would be a welcome gift. Homemade goodies (chocolate covered pretzels, trail mix, cinnamon almonds, hot cocoa, etc. ), homemade ornaments, gifts in a jar (bath salts, sugar scrubs, brownie mixes), homemade soaps, scarves...so many nice things to make that people would appreciate. Thanks for the wonderful contest...I would love to read THREAD AND BURIED! You mentioned pickles, but I have made canned dilled green beans for people some years, and they are always a hit. I like the above poster's idea about the knitted dishcloths, have missed those with the passing of my grandma. Those are good ideas. I would like to receive any of them. Of course even if not homemade (unless straight from the author ;-) ) I would have to add books. But limiting the number and size is good. I am not too "crafty" but this years if not small am trying to at least make the gift useful. As a single senior I love to receive homemade goodies as I rarely bake any more! I've read books 3 and 4 so either 1 or 2 (both on wishlist) if I should win. Home-made candles are always fun (and easy) to make! Any kind of homemade cookies----I hate to bake, but love eating holiday goodies. Some handmade bookmarks would also be very nice for readers. Homeade goodies are always well received in our house, but I have noticed that more abd more of my recipients are getting picky (allergy, some food they're avoiding because it's the trendy thing to do). I have dietary restrictions myself but would never turn my nose up at a heartfelt gift. Sorry-rant over. I also like to give gift certificates if money allows to experiences. Thanks for the giveaway. I would like Dire should I win. Handmade coupon wallet or makeup pouch. Your list is great. You could hand knit some pot holders. Very good ideas. You can also donate to a charity and put a note in the stocking. Homemade cookies, fudge. A precious item that has been passed down thru the generations. A scrapbook of family pictures would be a treasure. You can crochet things as well. Homeone sweets are always great! How about sending a friend an ebook? Cookie mix in a jar. Oh my gosh! How have I seriously not read Night of the Living Thread yet? I think when it first came out and I saw it took place in October I thought I'd set it aside until the real October, but then I completely lost track! Well, January sounds like a great time to start it. Great gift ideas by the way! I'm doing a few reusable shopping bags printed from a photo company with my kids' artwork on them. They are due to arrive today and I am excited to see how they came out. I guess those would be hand/homemade with a little help. :) I've never tried it, but apparently body scrub is very easy to make at home. Hand knit scarves, mason jar cookie kits, crocheted cloche? I haven't yet read one of your books, but would love to! Gingerbread sounds good. With whipped cream. I have the first two books in the series. Every year my husband and I make friends and family rum cakes for Christmas. Everyone loves them more than anything we could buy. Homemade truffles make a great gift. Being blessed as we are, a donations to charities are a good choice. A small gift for each of the family pets or a home made personalized stocking for the family animal including treats. Cookies in a jar, our soup in a jar. Don't forget to attach the recipe. Homemade cookies. Rather than getting gifts for everyone, we do Secret Santa with a $25 limit. These sound great. Would love to win. I think it would be nice to find a simple but cute bracelet in my stocking. Or another item I make to give someone that you don't know what to give is a suncatcher. Take bracelet memory wire. Collect a variety of crystal beads of various shapes and sizes and string them on the memory wire. Of course you need to make a loop at the top and at the bottom when finished. I also like to put something through the loop on the bottom like a Christmas ornament (snowflakes are nice). Homemade treats always make wonderful gifts. Home-made jewelry or hand knitted gloves are two of my favorites. This is a great series! I'm enjoying reading it. Would love to win a copy. Homemade treats - rum balls, Christmas cookies, fudge, fruit stollen and a lemon meringue pie for my son. Also a family scrapbook of past hoiiday and family celebration and events. Homemade goodies - Christmas cookies, fudge, rum balls, fruit stollen , and a lemon meringue pie for my son. A scrapbook of family celebration of events, holidays, vacations and special moments. That would be the best gift of all. Thank you everyone for such great ideas! 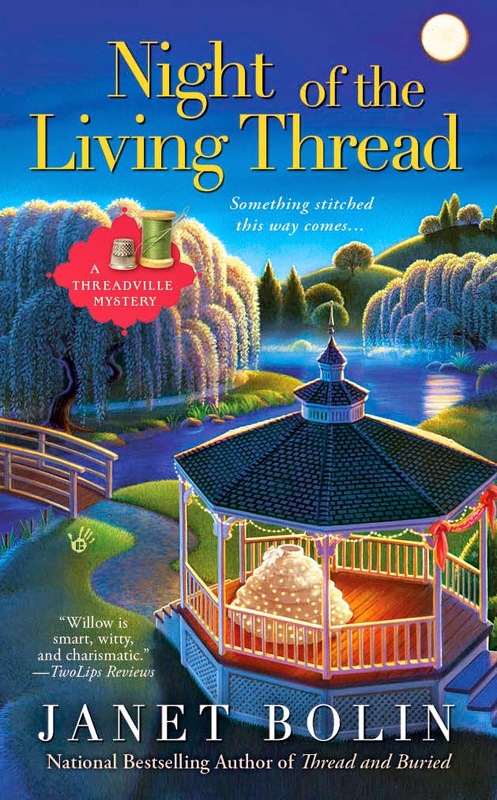 The Season's Readings winner of a Threadville book of her choice is Connie Reynolds. Connie, please contact Janet at ThreadvilleMysteries dot com. I cross my fingers when I'm hoping for something. I knock on wood when I've said something is a certain thing and then knock to hope that I'm correct.